ICY Couture was created in 2005 in Los Angeles, Ca, from a passion for Fashion & Glamorous Lifestyle. The company quickly became internationally known Brand Name & Market Leader to create high quality, sparkling pieces with Swarovski Crystals. It took almost 10 years to develop & perfect our unique crystal applying techniques, which only our expert designers posses. Unlike those imitations of ICY Couture that flooded internet in last few years, our Auto Icing will not fall apart in few months; it was made to last by our specially trained designers with many years of experience - true Masters in Swarovski crystallization field. 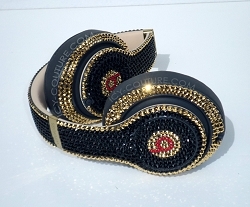 ICY Couture is for people who are seeking Top Quality in every aspect of their lives. All ICY items are made to be as durable as they are beautiful, keeping you happy for many years to come. Every ICY thing made with love and positive energy. From simple items to most complicated, no project is too difficult for ICY designers. That's why celebrities like Kim Kardashian, Selena Gomez, Justin Bieber, and others, chose ICY as their trusted Bling Shop. From personal to auto accessories, now expanding its collection to Home Decor, ICY Couture ships to clients around the world. ICY clients include other internationally well known companies, celebrities, reporters, athletes and musicians. "Behind the scenes it's not all glitz and glamour. You have to work hard to achieve your dreams. Many years of consistent hard work, long hours and sleepless nights. It's a choice of always working instead of having fun. Success doesn't happen overnight, it's not just given to you. With inevitable ups & downs, follow your dreams, dont loose your focus, or get discouraged, just keep pressing and work hard to move forward.. ..I am proud to work with exceptional and spiritual human beings. We love working long hours on making you feel more beautiful & happy with Icy sparkles. Whatever it takes, we will be here to make that happen for you in time and with perfection. Thank you for choosing us. ICY Couture currently located in Orange County, Ca and fulfills both wholesale and retail orders. We offer product as is, or with an option to customize items to a certain boutique style, or fashion trend.